A Victorian Romance or a Victorian Stalker? Alec Clifton-Taylor (1907-1985) was an English architectural historian, writer and broadcaster. His most influential book, ‘The Pattern of English Building’ (1962) was a landmark in the understanding of the importance of vernacular architecture. He died 30 years ago, but his work lives on in three series of BBC TV programmes, each published as a book – ‘Six English Towns’ (1977), ‘Six More English Towns’ (1981) and ‘Another Six English Towns’ (1984). Lewes featured in the 1981 series, and we shall be re-visiting that from a 21st century perspective. Alec Clifton-Taylor’s emphasis was on the use that local builders made of the materials available in their locality – in Lewes chalk and flint from the Downs and timber, brick and tile from the nearby Weald. He studied and admired the skills they developed and was particularly taken by the Lewes use of mathematical tile. He was critical of Victorian and later builders for their use of cheaper alien materials, imported by the railway, and their neglect of traditional skills. His work was part of a wider movement that expanded history from being primarily the study of old documents to include a much wider range of evidence, including the surviving landscape and its vernacular buildings. The recognition of how much can be learned from such sources underpins the flourishing local history movement, of which the Lewes History Group is a part. We can be confident that he would have approved of our Street Stories project. This walk, which will take in the location where the skeletons of the captured and executed Vikings who featured in our March talk were discovered, is planned to take 60-90 minutes. Greg will point out the key archaeological features on the hill during a walk up to the long barrow on the golf course. There are a few steep sections down on the way back, but these can be bypassed. This is a joint event with the Lewes Archaeological Group and the Ringmer History Study Group, who also contributed to the cost of the experimental work that established that the skeletons were not local in origin. Meet at the car park on Mill Road. The Sussex Archaeological Society website sussexpast.co.uk includes in its research section an ‘archaeology round-up’ archive comprising brief reports of the many excavations carried out in advance of development that would otherwise go unrecorded. The February 2016 round-up includes five Lewes reports of excavations at 21 High Street; the Coach House, Brack Mount House; 25a Priory Street; the former Magistrates Court site; and 2A Chapel Hill. The Brack Mount House excavations were during the grubbing up of the Coach House floor to lay a damp-proof membrane and a new floor. This revealed part of a large linear pit that disappeared under the coach house wall, a tree-throw hole and a small burnt feature. The pit and the tree-thrown hole contained early-medieval pottery dating from AD 1050-1150. There was also animal bone, charcoal and carbonised cereals. Further survey work would be needed to establish whether these features lay on the edge of Brack Mount or underneath it. They may well be contemporary with the construction of the mound, and if underneath it would set a limit to its construction date. In early April 1878 the press such as the Morning Post, the London Evening Standard and dozens of regional newspapers across all four countries of the United Kingdom carried a report of a young man being prosecuted at Lewes for inciting, via a letter, another Lewes man to fight a duel with him, and thus breach the peace. While duels were commonplace in the early 19th century, with at least three prime ministers recorded as participants, by the middle of Queen Victoria’s reign they were considered a thing of the past. There were quite detailed accounts of the case in the 13 & 16 April 1878 Sussex Advertiser, printed in Lewes. Up before three Lewes magistrates was Malcolm Fraser, aged 25 and “described as a gentleman”, who had formerly been a lieutenant in the Royal Sussex Artillery Militia. He had been born at Charlwood, Surrey, in 1853, and the 1871 census finds him as a student aged 17 at a small private school in Tunbridge Wells. He had an older brother who was a lieutenant in the regular artillery. The man to whom the offending letter was addressed was Francis Barry Whitfeld, a young man of about the same age, who was also a partner (along with his father George Whitfeld) in the Lewes Old Bank. Francis Whitfeld, through his attorney, prosecuted the case. It was stated that the prisoner had been introduced to the Whitfeld family and about three years earlier had formed an attachment to Francis Whitfeld’s sister Edith. Edith the daughter of George & Charlotte Whitfeld had been baptised at All Saints church on 23 January 1854, so she would have been about 21 at the time. George Whitfeld had discovered Fraser’s attachment to his daughter and “forbade it”, but the young officer did not give up his quest. On one occasion when the lady was staying in another county he disguised himself as a smock-frock-wearing rustic in an attempt to get an interview with her, but his behaviour in this unfamiliar role attracted sufficient suspicion to get him taken into custody. The letter to Edith’s brother for which he was prosecuted was addressed from the Star Hotel. It was thought to have originated from an incident at the Ringmer Steeplechases at which both were present, but Francis Whitfeld had passed Fraser without acknowledging him. The meaning of this message appeared unambiguous to all concerned. On the following day Fraser despatched a letter to Edith herself, begging her to come away with him. This was sent via a Hamsey boy (the Whitfelds had a country house there called Hamsey House) and was again intercepted. His final letter was to Edith’s father, asking to see Edith alone for just one hour, and saying he would only accept his dismissal from her own lips. The appearance before the magistrates was quite brief. Fraser asked to be committed to the Assizes, where the case would be heard by a judge, rather than to Quarter Sessions where it would be heard by the magistrates. He may have had good cause – Edith’s father George Whitfeld was one of the magistrates on the Lewes bench and the three magistrates hearing his case included, along with Burwood Godlee and Robert Crosskey, George Molineux who was the business partner of George Whitfield and Francis Barry Whitfeld at the Old Bank. The main issue for the magistrates was whether Fraser should be allowed bail. They decided that this needed to be substantial, so he was required to find two sureties for £300 each in addition to a personal security of £600. Fraser feared this could be difficult, as he said there was prejudice against him in Lewes. His fears were justified. It may not have helped his case that, in the course of his three year pursuit of Edith Whitfeld, he had also met and in 1876 married the daughter of the landlord of the Star Inn. This was well known to all the Whitfelds, including Edith – the Star Inn and the Whitfelds’ town house, Old Bank House, were immediate neighbours on Lewes High Street. It was in any case explicit in his letter asking her to elope with him that he was already married, so unable to marry her. It took Malcolm Fraser six weeks to post his bail – his own recognisance for £500 was eventually accepted. His subsequent behaviour then was reported in the 21 May 1878 London Evening Standard and 22 May 1878 Western Times. Two days after his release he shot himself in the face at Falmer and was taken to the hospital in Brighton. His injuries do not seem to have been too serious. He was back in court in July 1878 for the final hearing at Quarter Sessions, when the case was again reported across the nation. He then pleaded guilty to the charge. However, shortly before he was released on bail he had written a letter to George Whitfeld stating that he was truly repentant for the misery he had caused his family, and the family now said they were satisfied that the annoyance would not recur in the future. It was noted that a new career had been found for him “out of England” though in a statement to the court Fraser said that “he wished the court to understand that the fact of his proposal to leave the country had nothing really to do with the case, and he was not taking that step with a view to obtaining leniency at the hands of the prosecution.” He was bound over to keep the peace on his own recognisance of £500. What Edith Whitfeld thought of her suitor’s pursuit is not recorded – it was certainly not a concern of the court. However, she was not unconsolable. In September 1879 the Pall Mall Gazette reported the marriage at St Mary Abbot’s, Kensington, of Edith, second daughter of Mr George Whitfeld of Hamsey House, near Lewes, to Mr Edmund Burke Robert Nugent. Her husband was involved in banking. They had at least two sons, the first quite promptly after the marriage, and lived in Pinner in 1881, Kensington in 1891 and Brighton in 1901. Sources: Victorian newspaper articles and notices located through the British Newspaper Archive website and family information identified through the Familysearch website. 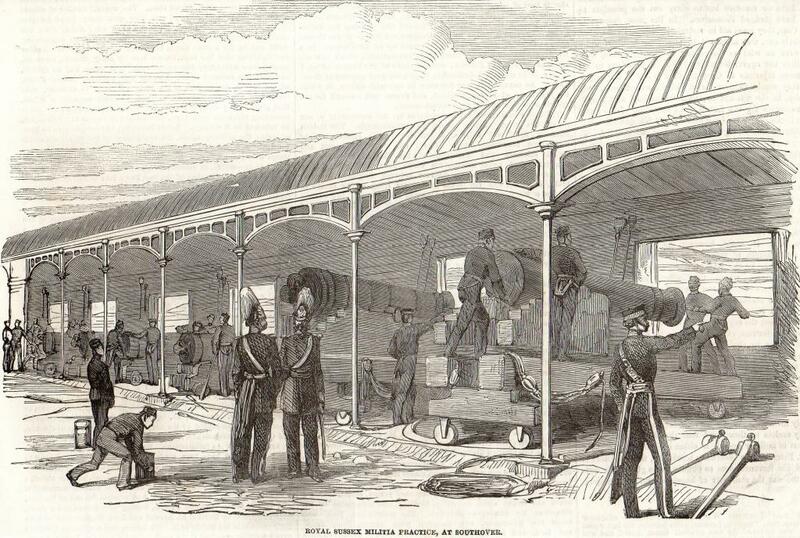 This engraved print from an 1854 edition of the Illustrated London News shows the Royal Sussex Artillery Militia engaging in drill in a mock-up of a Victorian fort at Southover. I recently read a self-published autobiography called ‘Onwards and Downwards’ by Rachel West, published in 2015. The author grew up in Rodmell and then Ringmer in the 1940s and 1950s. She now lives in Torquay. She changes all the names, including her own. Copies are available online. This entry was posted in Antiquities, Art & Architectural History, Cultural History, Family History, Lewes, Local History, Military History, Social History. Bookmark the permalink.